As hundreds of thousands gathered at the nation's capital for the March for Our Lives, one special attendee took command of the podium. 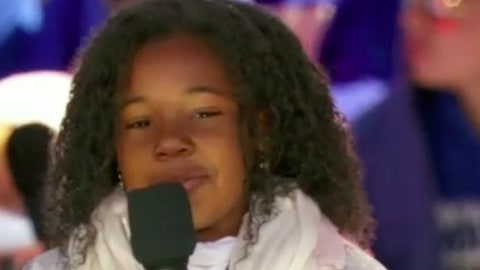 During Saturday's rally (March 24), 9-year-old Yolanda Renee King, the eldest granddaughter of Martin Luther King Jr., made a surprise appearance, going on to deliver one of the most memorable speeches of the day. "My grandfather had a dream that his four little children will not be judged by the color of their skin, but by the content of their character," King's granddaughter shared, addressing the crowd. "I have a dream that enough is enough. And that this should be a gun-free world, period." King then led those in attendance in a chant: "Spread the word! Have you heard? All across the nation, we are going to be a great generation!" The March for Our Lives rally in D.C. was one of more than 800 taking place around the world, with the mass protest being predominantly organized by survivors of the February school shooting in Parkland, Florida. Take a listen to Yolanda Renee King's brief but powerful speech, below. REVOLT Remembers | Dr. Martin Luther King Jr.
A playlist for a King: Singing the praises of Dr. Martin Luther King, Jr.